Who: David R. Gillham is the author of the NYT bestselling City of Women. He studied screenwriting at the University of Southern California before transitioning into fiction. After moving to New York City, Gillham spent more than a decade in the book business, and he now lives with his family in Western Massachusetts. Annelies is his latest novel based on the life of famous diarist Anne Frank. What: What if Annelies Marie Frank, better known as Anne Frank, survived the Nazi death camps to become one of the few to return to a broken post-war Europe? Gillham’s novel explores this possibility of the return of a broken and brutalised Anne to a home in shambles where her father, Pim, is the only surviving member of the Frank family. But whereas Pim is intent on picking up from where the family left off, Anne is tormented by the horrors of the war, by the betrayal of her family at the hands of Nazi conspirators and her own deeply rooted survivor’s guilt. To top it off, the diary which had become her sole comfort and inspiration goes missing after the family’s arrest. She is desperate to flee her past, but options are few for Holocaust survivors in post-war Europe. 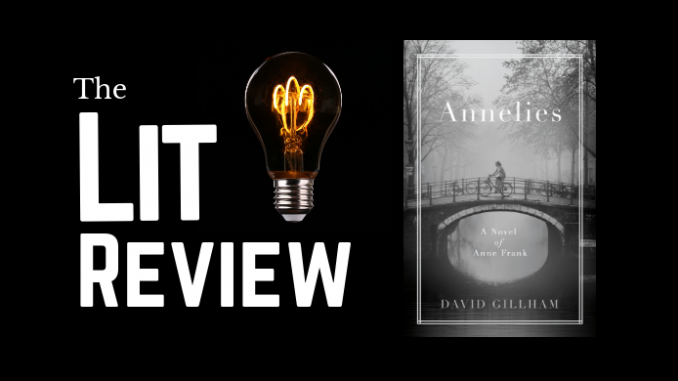 In Gillham’s retelling, the Anne Frank story begins in the weeks leading up to their decision to go into hiding. Anne is a vivacious and somewhat difficult 13-year old (read: typical teenager) unlike her more sober-minded and responsible older sister. Despite having fled their home in Germany and now living in Nazi-occupied Holland, the Frank family did okay for themselves with Pim having set up a fairly lucrative pectin business and the girls seemingly adjusting well to their new Dutch identities. But anti-semitism was on the rise and the Frank family opted to go into hiding, and were subsequently betrayed to the Gestapo. Why: Few Holocaust figures have captured the imagination quite the same way as Anne Frank, whose diary provides a vivid and poignant look into life under occupied Holland. Living in a secret annex behind her father’s offices, Anne’s diary was a living record of fugitives attempting to live as normal a life as possible despite the daily threat of betrayal or being discovered by the Nazi secret police. Anne dreamed of being a writer and she filled her diaries with stories and descriptions and ruminations of life within her secret space. The real Anne would not survive the Bergen-Belsen concentration camp, and would succumb to disease just weeks before the camp’s liberation by the British forces. In Gillham’s Annelies, Anne survives — just barely — Bergen-Belsen, but she returns a changed woman. Unlike Pim whose faith in god and humanity survives the death camps, Anne, who bore witness to her mother and sister’s deaths, has now become a jaded, cynical and empty woman. Moreover, her diary which was both the literal and figurative representation of her ambition, has gone missing. Wracked by guilt, uncontrollable anger and grief, Anne can find no succour in her new life in Holland and is desperate to start somewhere else. Her desire for a new beginning puts her at odds with her once beloved Pim, who begins to find that post-war Europe has yet to come to terms with its own anti-semitic past. The book is wonderfully descriptive and the characters well fleshed out. The development in Anne’s character is believable and the horrors of the Nazi camps — as well as life after — rigorously researched. And yet, there is a sense that Anne is somewhat diminished in the book. This may be an unpopular opinion but an essential part of the real Anne is the tragedy of her life cut short, leaving behind nothing but her living record of the days leading up to her arrest. Don’t get me wrong — there is much to admire in surviving the Holocaust but therein is the problem; Anne’s story post-war becomes a survivor’s story but it could have been any survivor, and not one unique to Anne. Ultimately, I suspect the intrigue of Anne Frank is due as much to the diary she leaves behind as well as the fact that it is the only thing she leaves behind. Special thanks to Viking Books for a review copy of the book.